My very first X-Men comic books--still got 'em! 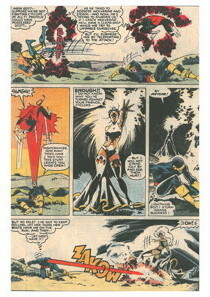 Classic X-Men #33 and Uncanny X-Men #245. This is the story of when I fell in love with comics. Well, X-Men comics, anyway–Archie comics were my gateway drug. I’ve always been a voracious reader. From my first “chapter book,” Charlotte’s Web, when I was six, I dove into all of the children’s and YA literature I could get my hands on–particularly series. The idea of following a character like Laura Ingalls or Anne Shirley–or a girl detective like Nancy Drew or Trixie Belden–for years, was super appealing to me. The story never had to end! It was the year 1989. By the time I was 14, I had some experience with superhero comics. My older cousin, Bryan, had a large collection of Teen Titans and Warlord comics that I would pilfer when we visited–a practice that my Aunt Judy supported, as I was well-known as the family bookworm. The fact that Bryan, who was a big fan of Ozzy Osborne, seemed somehow threatening didn’t deter me: I would sneak into his room when he was out, grab gigantic handfuls of comics, and retreat to my cousin Danny’s room to read them in peace while he tinkered with his Commodore 64. But I digress. It was the year 1989, I was 14 and obsessed with Axl Rose, and I was on a trip to Hawaii with my parents and my younger brother. My parents, avid golfers, would occasionally leave my brother and me to our own devices, which for me, meant (surprise!) reading. Midweek, crisis struck: we had officially read all of the Archie comics the corner store had in stock, so I was forced to read two “boy comics” my little brother picked up: Classic X-Men #33, and Uncanny X-Men #245. This is when my life changed forever. This is literally the moment that led me to where I am today, working for Things From Another World and hanging out in the comics community of Portland, Oregon. 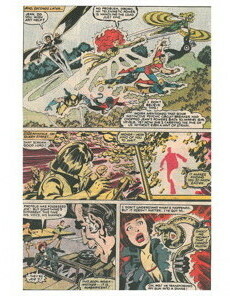 Classic X-Men #33, a reprint of Uncanny X-Men #127 (collected in the X-Men: Proteus Premiere HC, which I also own), was an action-packed entry into the X-Men. 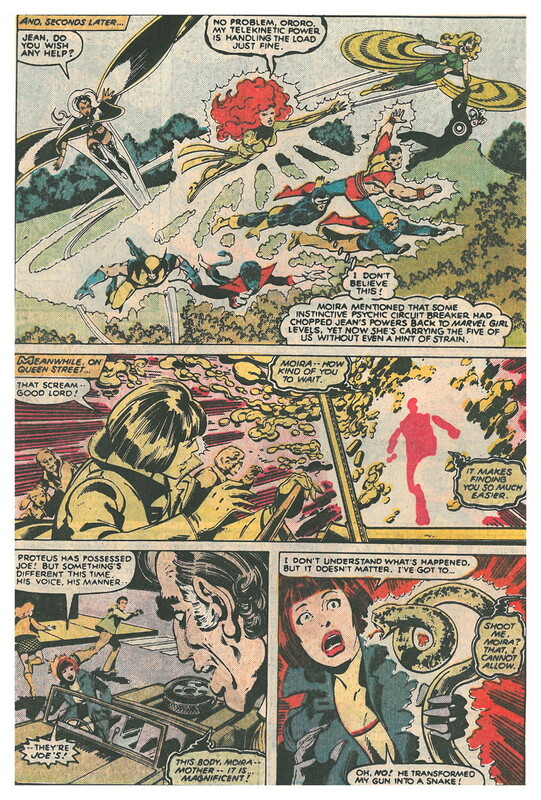 Brief recap: the X-Men are in Scotland, fighting Proteus, a terrifying and powerful enemy who just happens to be the secret son of their ally, Moira MacTaggart. And he kicks their butts, leaving the team shaken to the core, leading Cyclops to instigate a fight with Wolverine and the rest that is visually fun to read and showcases each member’s strengths and personalities. This was a great way to “meet” the team, and the drama of Moira steeling herself to kill her own son (who eventually took over the body of her estranged husband!) was intriguing to me. Chris Claremont’s rather wordy and character-focused writing style appealed to a girl who was ready to graduate from Anne of Green Gables. This issue also began my lifelong fealty to (some might say obsession with) the beautiful and exciting art of John Byrne. 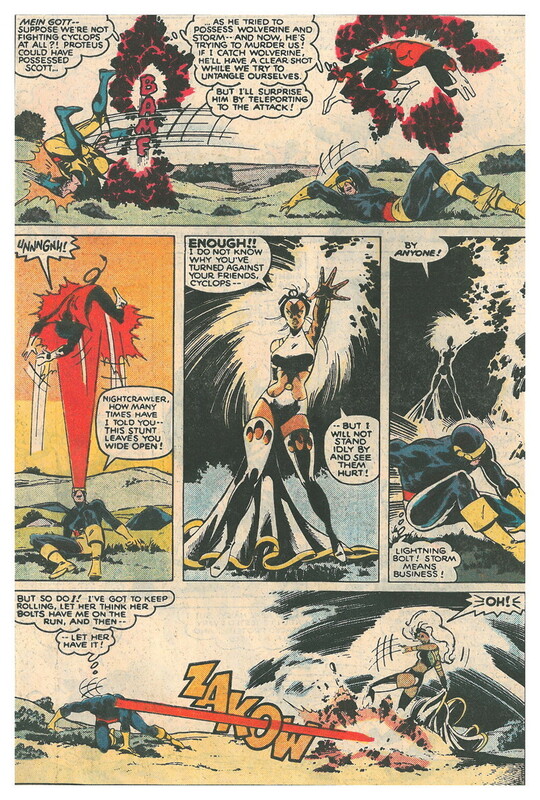 Note: This issue also had a bizarre and gory backup story starring Havok and Polaris, by Ann Nocenti and John Bolton, that freaked me out: Havok basically imagines them dying horrific deaths over and over, and then rejects life with the X-Men. I admit this story left me with a very bad impression of Havok for years. After reading Classic X-Men #33, Uncanny X-Men #245 was completely confusing. To anyone who hasn’t read this gem, titled “Men!”: this is a humorous issue after the drama of Inferno, drawn by a young Rob Liefeld (spelled “Leifeld”), in which inept aliens decide to take over the planet–beginning with Australia–while the men of the X-Men have a guys’ night out. Oh, and the aliens have a “Jean Bomb” that looks just like Jean Grey, which they claim will “fatally disrupt any and all relationships.” Since I hadn’t yet read the Dark Phoenix Saga or Inferno (something I would quickly remedy) the humor was lost on me. 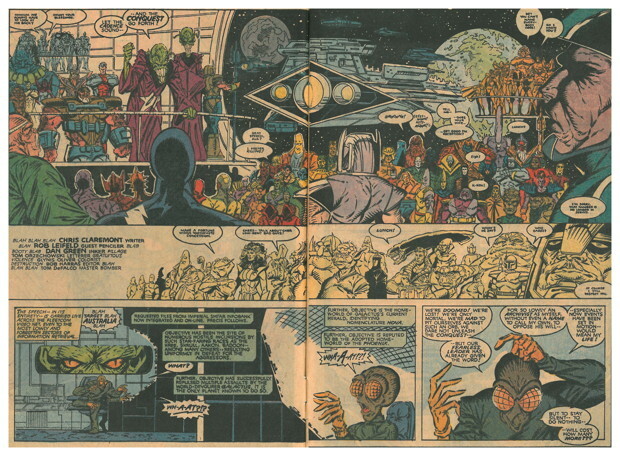 While my brother and I enjoyed picking out various Star Wars characters that were extras on page 3 (Yoda! Jabba! Chewie! ), we really didn’t know what to make of this. Was the Classic X-Men series the serious stories, and Uncanny was the funnybook? It was a headscratcher. My solution: to buy as many X-Men comics, past and present, as possible. These two comics lit a fire in me that caused me to seek out my local comic shop for the very first time. I started a box; first with just Uncanny X-Men, later expanding to Excalibur, X-Men, X-Factor, and X-Force–the ’90s crossovers pulled me in. From that moment on, all of my extra funds were funneled into a back-issue collection I still have today. No lipgloss or tapes for me–I was spending my money on cardboard boxes, bags and boards, and comics; family vacations, to me, now meant the chance to seek out new comic shops that just might have that back issue I was missing. I was on a quest! Looking back, two things strike me: one, I wasn’t introduced to comics via a comic shop–we always bought our comics at convenience stores up to that point. Two, it took me several months to realize that I was the only female customer at my shop who wasn’t a mom or a bored girlfriend. We’ve come a long way, baby. 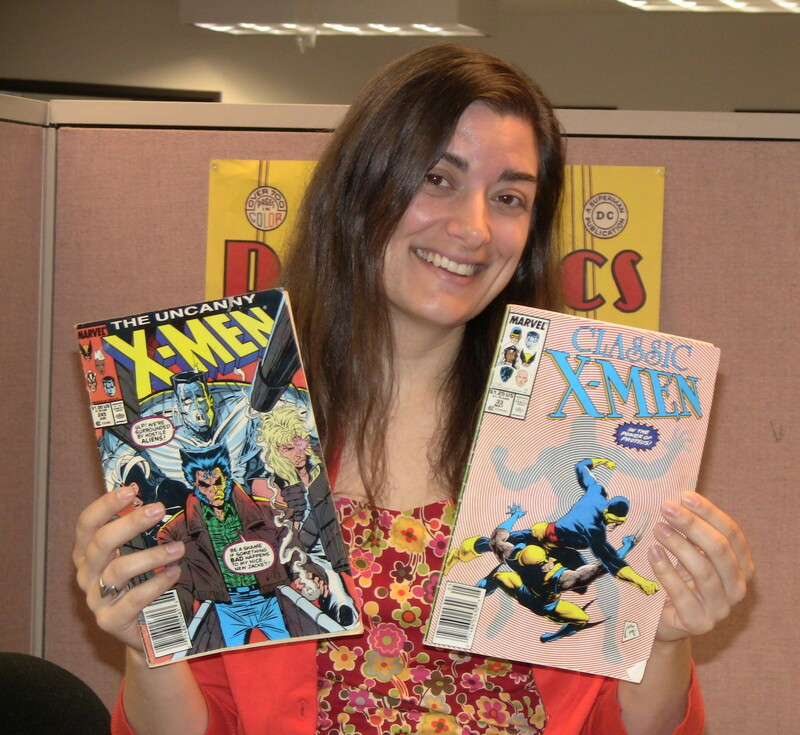 So that’s my story: my name is Elisabeth Forsythe, and I’m a comics addict. What comics were your first love? Post your story below by August 16 and you could win a $20 gift certificate to buy more comics at TFAW! Standard contest rules apply. Open to Canadian and international customers, too! Meet J. P. Kalonji of 365 Samurai!